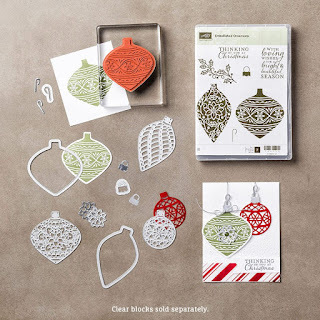 CTC#58 Christmas Decor and Gift wrapping. 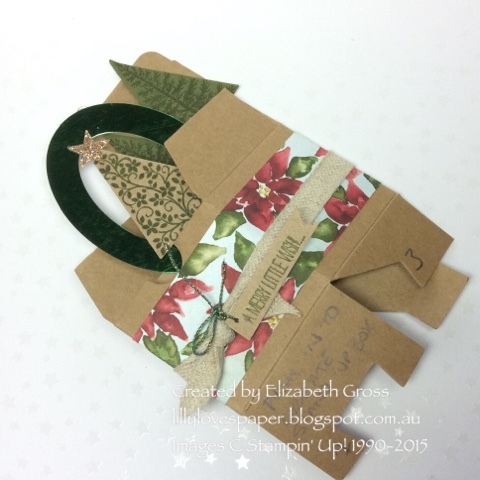 Welcome back to CTC for this week's entry - to be inspired by a 3D item or giftwrap and packaging from the Occasions Catalogue.You may have arrived here from Helen's great blog, or you may be starting here, but wherever you have arrived from you are very welcome, and I hope you enjoy linking to each blog in the hop for some great ideas. I have some boxes for you today. Since Christmas is also a time when budgets are stretched it's a great opportunity to take advantage of the hugely discounted items in the Clearance rack. Have you been and had a look lately? I have decided to showcase some of the great gift wrap options for you. 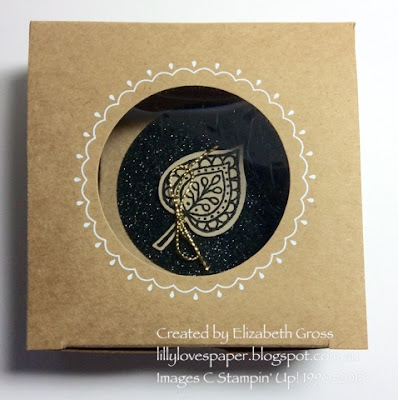 The gift tag is 2 pieces of card cut to 2" x 5" and punched with the Tag Topper Punch. 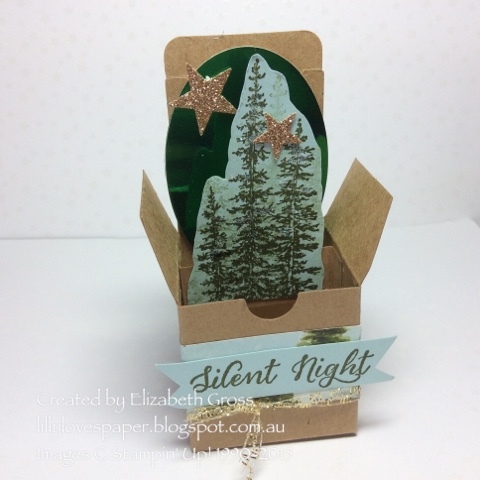 the lower piece is gold foil and the upper piece of Kraft has the word cut with the Christmas Greetings Thinlits Die(139659). 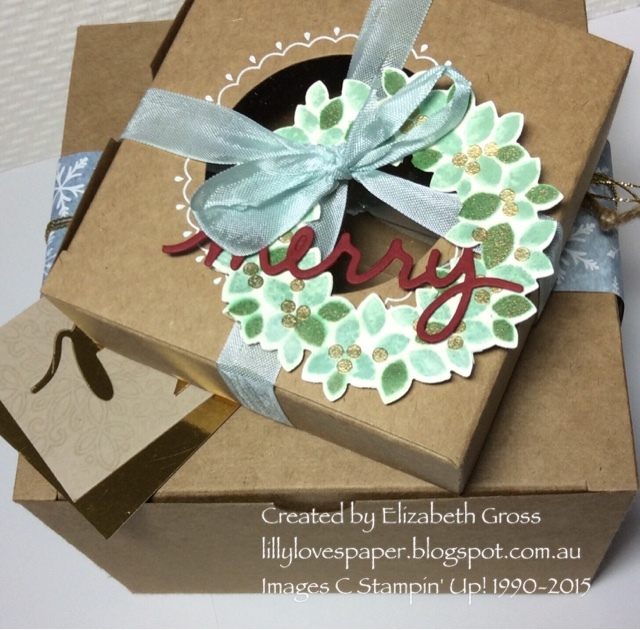 Super quick and easy, tied together with some Thin Gold Ribbon (134583). 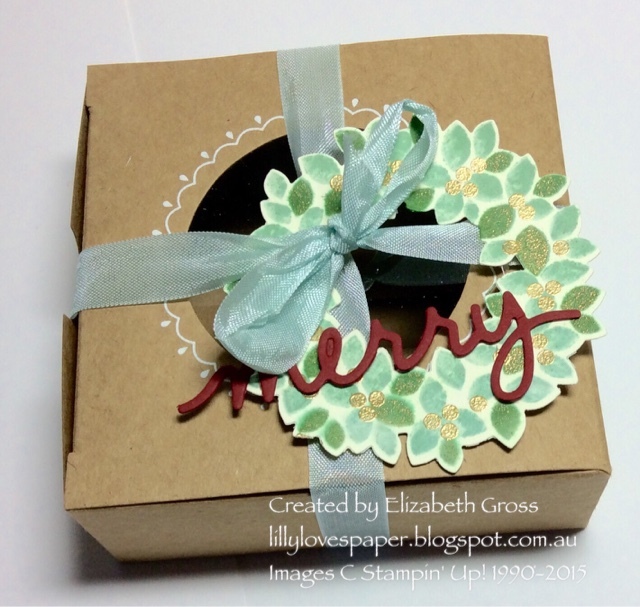 The box is wrapped with a belly band made from 2x 12" strips of DSP from the Season of Cheer paper cut 2" wide and joined together under the tag. I have wrapped the box with 3 layers of the Gold Cording Trim(139618). I'm really sad this is not continuing after January so make sure you stock up on it - at $8.75 for 22.9 m (0.38c/m) it's pretty good value, but even better it ties so well and the texture of the cord means that it stays tied and doesn't slip on itself. The silver is also gorgeous. 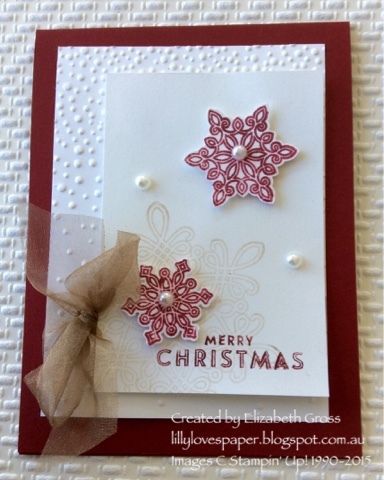 The tag is decorated with some gold embossed snowflakes made with the Festive Flurries set and the matching punch. 15.2 x 15.2 x 11.1cm (6 x 6 x 4 3/8) They are a good size, and easy to decorate. Of course you can stamp directly onto the box prior to assembly. This shows the large box underneath and the smaller window box on top. $3.59 for a pack of 6 (down from $8.95) , that's only 0.60c each. 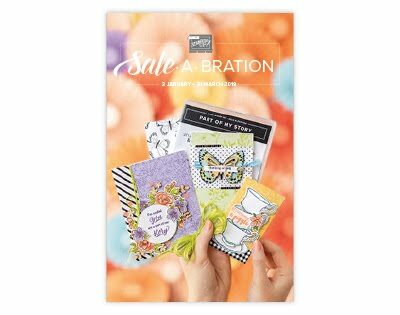 These are a good size for a set of 3x3notecards and envelopes. 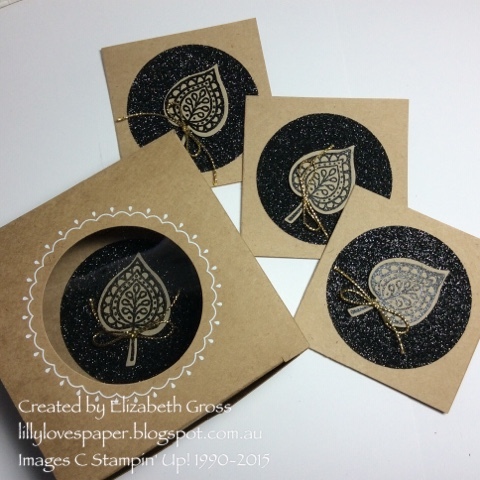 This is a little set I have made with Lighthearted Leaves and Black Glimmer Paper - two more items on the retiring list from the Occasions Catalogue and not available after January 4 or if sold out sooner. I have been playing a lot with this set and you can see some more samples in earlier posts here. Seam Binding is beautiful and soft and ties easily into lovely soft bows as shown above. At $4.79 per roll of 9.1m (down from $11.96) it's 0.53c/m which is great value. I have used soft sky here , but pool party is also available and looks great with the traditional colours of Red and Green. Chevron Ribbon is a great weight and ties wonderful bows and is available in a range of colours. At $6.39 per roll of 9.1m it's a great saving from the original $15.95. There are other great ribbons on the clearance rack which would also work well for Christmas- Mossy Meadow and Gumball Green stitched satin ribbon. 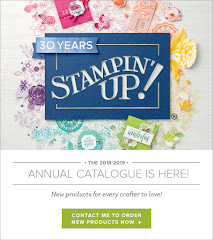 For all these great products you can find them through the Shop Now button on the right hand side of the page here, or at my Stampin' Up! 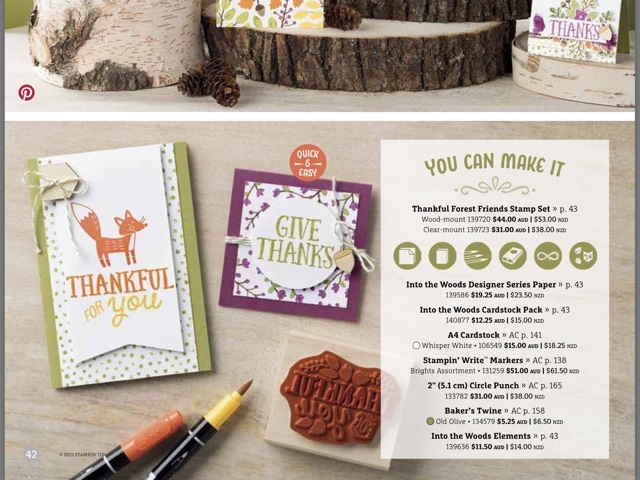 homepage, or you can contact me directly through commenting here, or my facebook page or email and I will happily help you order your Christmas Gift Wrapping supplies. 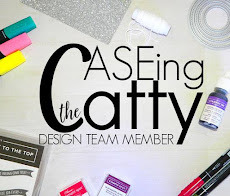 For more wonderful ideas you can check out the rest of the design team at CASEing the Catty. Next on the hop is Julia, check out her gorgeous project. 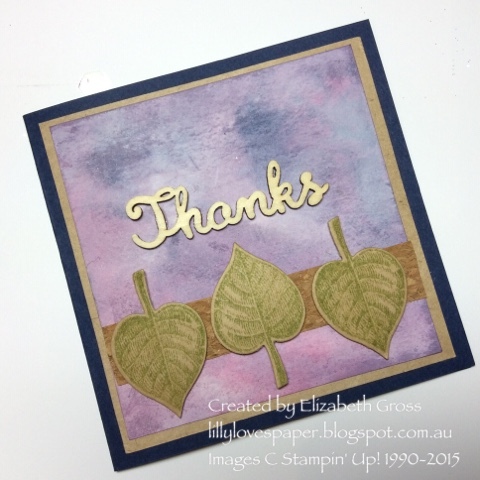 Lighthearted Leaves - a retiring favourite. I think any paper crafter can easily understand why the adult colouring craze has taken off - we've been doing it for relaxation for ages. 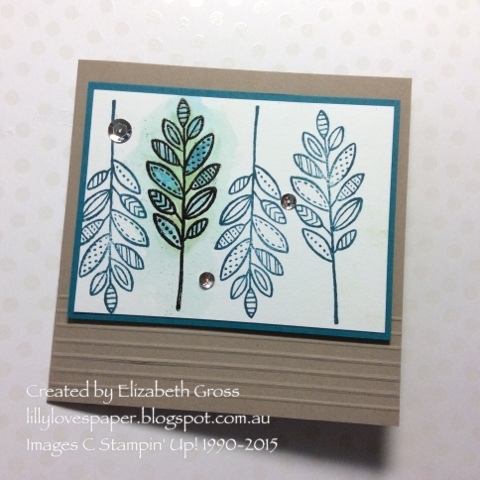 I am particularly enjoying colouring in with my blender pen and using the aqua painter as a finishing touch, and the Lighthearted Leaves set is perfect for this. Here are a few samples I was working on recently. I wonder if paint by numbers is the next craze to return? Sadly Lighthearted Leaves won't be returning so if you like the look of what you can do here you need to order it before the catalogue retires. It's easy if you go to my online store here or you can drop me an email and Ill be happy to order it for you. 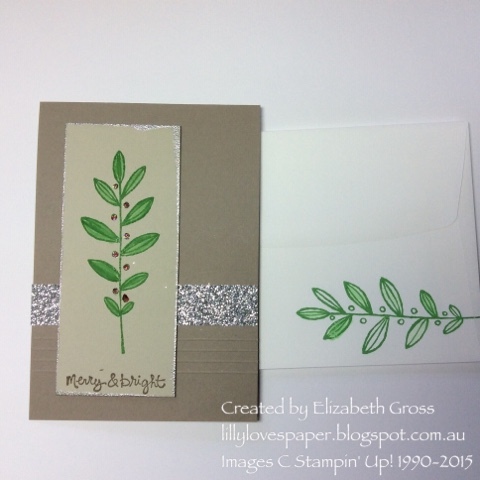 The LightHearted Leaves set is so lovely to use. I am really enjoying colouring in the different images. Some with multicoloured leaves and some just plain. 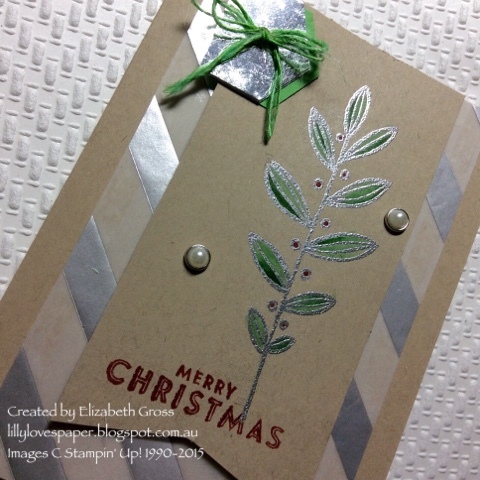 This Christmas set uses Tip Top Taupe as the base, which I have decorated with a few simple horizontal lines scored with my scoring board and a strip of silver glimmer paper. 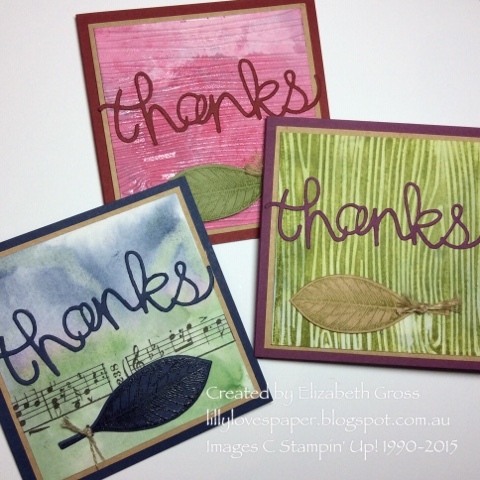 The leaf image is stamped with Cucumber Crush which is such a gorgeous vibrant and fresh green. I have filled in the leaves with the blender pen and coloured the berries with a red marker. 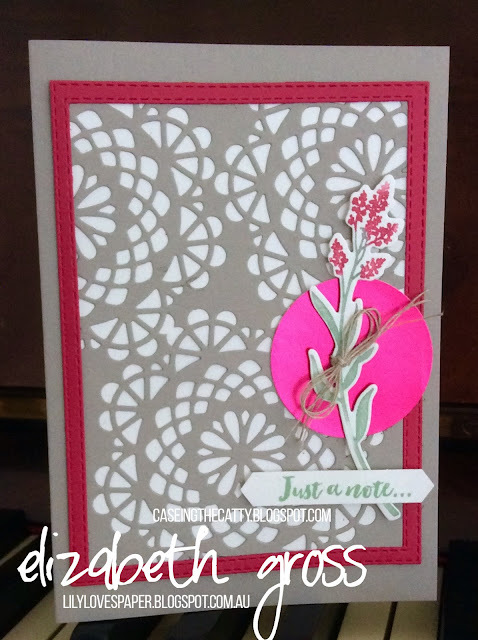 I have been wanting to try the technique for the edges and this card seemed the perfect one to use it. I simply ran the edges of the card (Saharah Sand) along the Versamrak ink pad, and then dragged the edges through a little pile of silver embossing powder. It's super easy and I love the effect. To finish the berries I dotted some dazzling diamonds glue over the red. Simple and easy, and a little bit stylish! 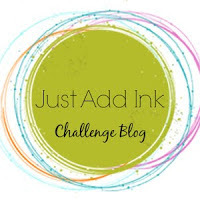 The Challenge this week is to Just Add Music at Just Add Ink, so this is my entry for the Challenge. 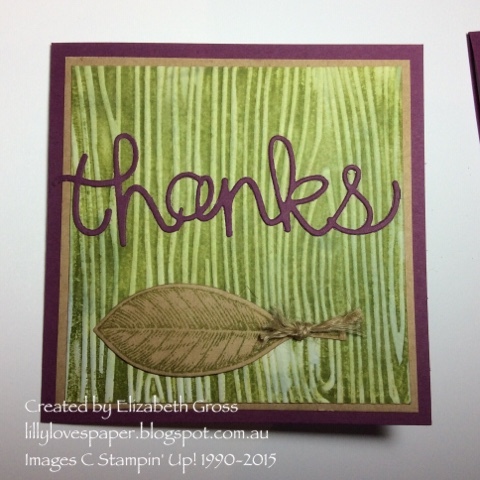 I only recently bought the Vintage Leaves stampset and I love it. 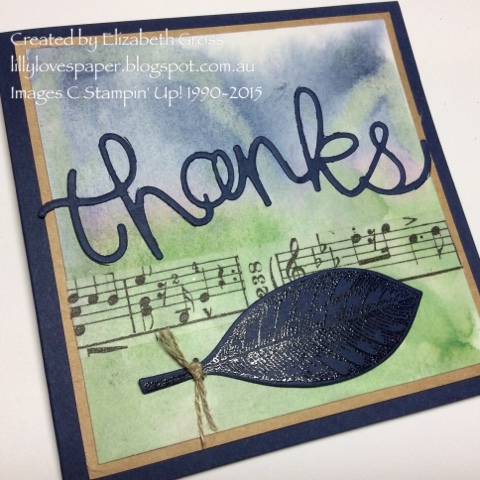 I already had the framelits which I purchased with the Lighthearted Leaves set - also gorgeous - and I have made quite a selection of cards with that set which you can see on another post (here). 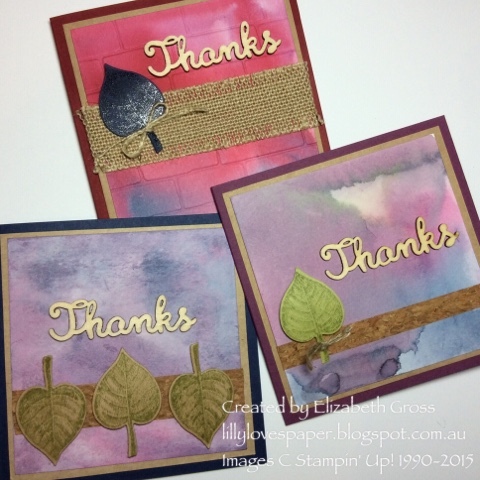 This is a set of thankyou cards which i made for a friend and they are all watercolour wash backgrounds using Cherry Cobbler, Rich Rzzleberry, Old Olive, Night of Navy and Wild Wasabi. She loved them! The leaf is embossed with clear embossing powder on Night On Navy. I always stamp the inside of the card and the envelope to match with a collage of images. 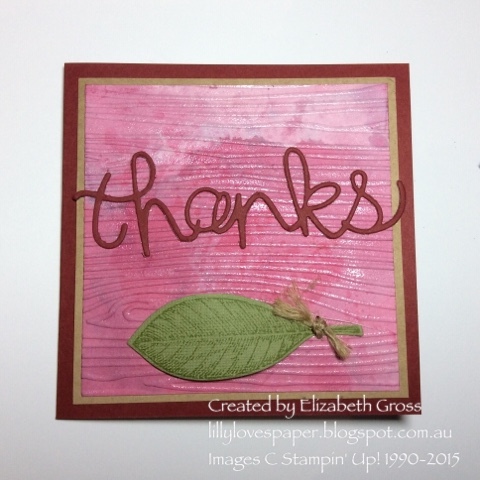 These are from Vintage Leaves, Painted Petals and French Foliage. 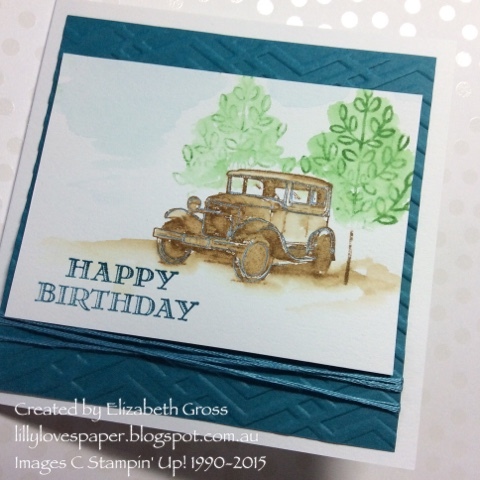 For this one I inked up the embossing folder. 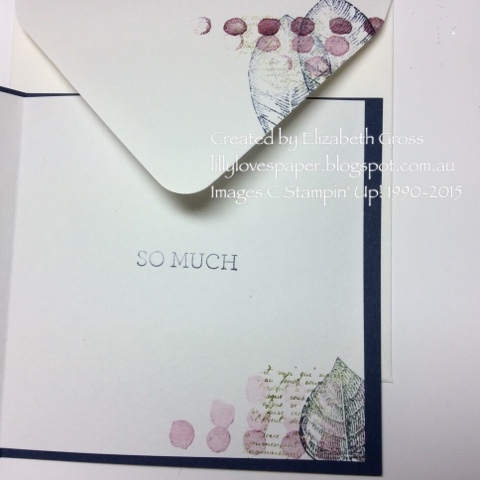 This one has versamark and clear embossing powder lightly applied to the raised embossed ridges. 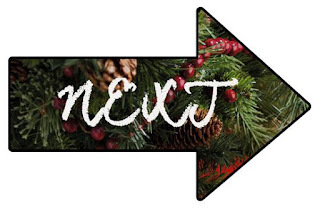 You may have arrived from Kathryn's beautiful blog I hope you find some inspiration to get your Christmas crafting underway. There are so many bundles in this Christmas catalogue which makes crafting so much easier. I have chosen the beautiful Flurry of Wishes bundle this year, which is strange for me because Snowflakes have never symbolised Christmas for me but this set is just lovely. 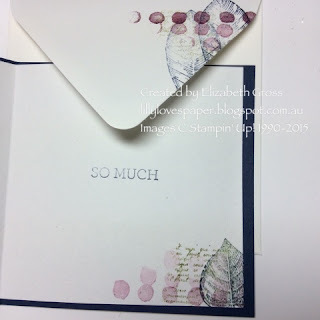 the photopolymer images have a celtic feel to them and the matching punch makes it super easy to whip up some great cards. 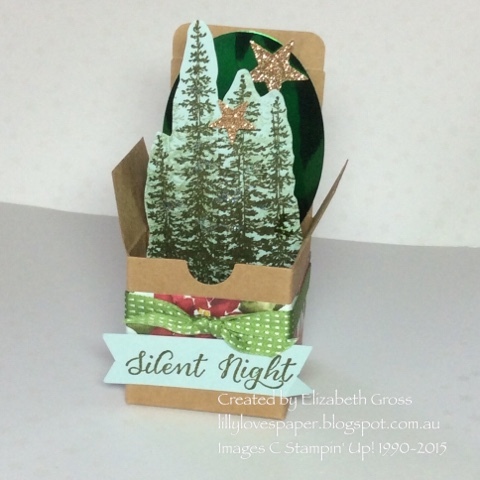 We had a Christmas Stamp-a-stack recently and these are the cards we made. I am grateful to the original designer of this card since I have CASEd the layout from somewhere on Pinterest but it's such a gorgeous layout and perfect for a class. 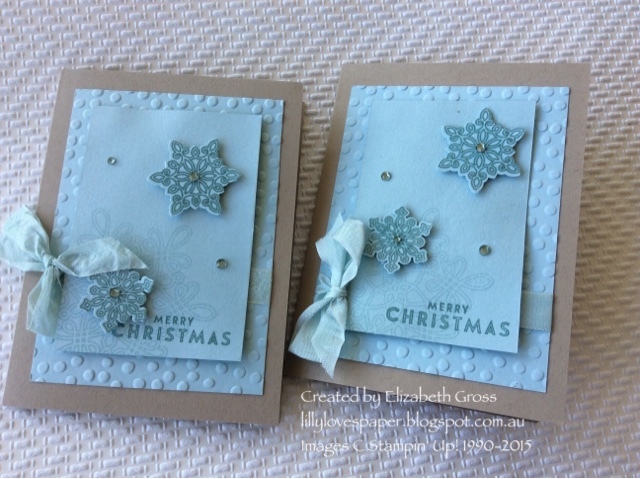 I changed up the colour scheme to use Crumb Cake for the card base and Soft Sky for the two panels, with some soft sky seam binding for the bow. I played around using crumb cake for the large stamped image to tie in with the base but it just didn't work so well, and I settled on Soft Sky ink on the Soft sky panel while the snowflakes are stamped in Lost Lagoon for the punched images which adds a dramatic element. This is great for making a large number of cards quickly. The addition of some shimmer spray if you have any makes a lovely finish though I haven't done that here. The original card I saw was done in Cherry Cobbler which seemed odd for a snowflake, but it looked very effective and I made a few samples to show the class how colour changes a layout. 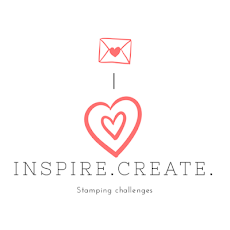 Thanks for visiting my blog, next on the circle is Julia, I'm keen to see what magic she has created this week. 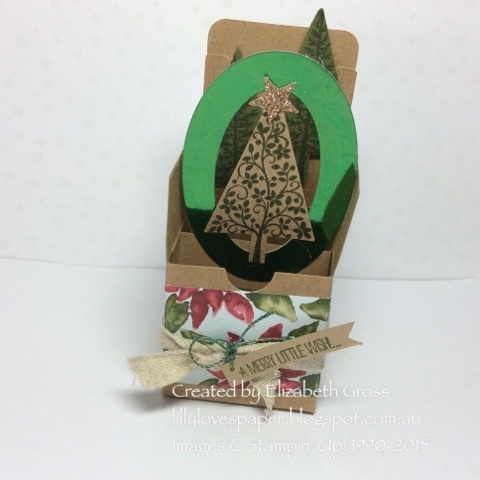 I have been using a few Australian made dies recently and love the new Grasstree die which comes in a set with the old Rusty Ute. 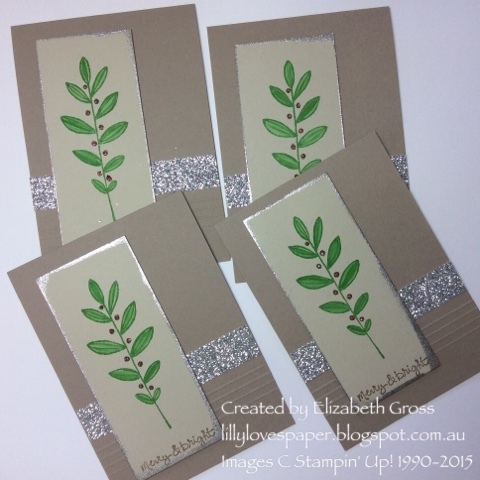 These are some sets of cards I have made using strips of old maps-( these are from the Mundubbera sheet 9046) and the grass tree die. 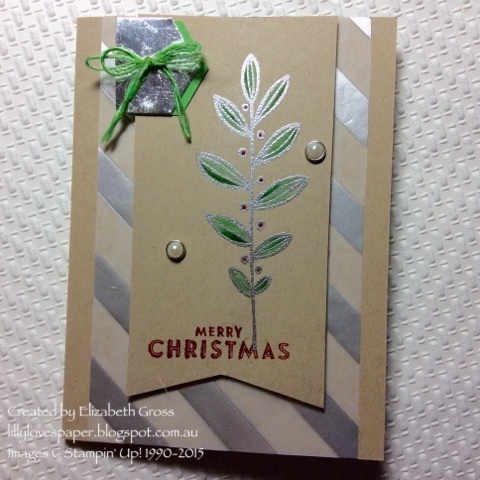 I have cut the shape from Always Artichoke card and then sponged the flower stems with Early Espresso, and stamped some foliage texture on the leaf base using leaves from French Foliage. I love how they have turned out. The envelope and the inside of the card also have some stamping using images from Tap, Tap, Tap, Gorgeous Grunge and Because you Care. 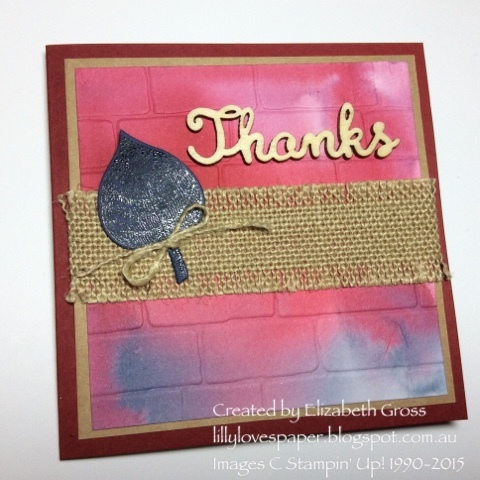 I love to layer these sorts of images to finish off my cards. They come packaged like this. Well I was too late - actually too busy - to get my post ready for last week but I had made the little boxes for the markets so thought I would add them in to the mix anyway post production... 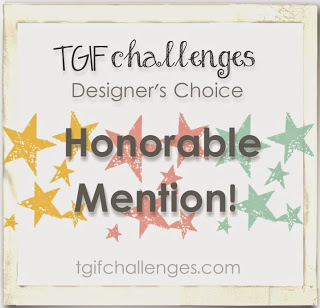 There are some gorgeous projects in the CTC bloghop this week and I hope you have been able to get some inspiration. 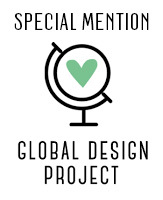 You can find the full list of design team members and links to their posts here. I think Julia is right, they add a fresh take on classic Christmas colours. 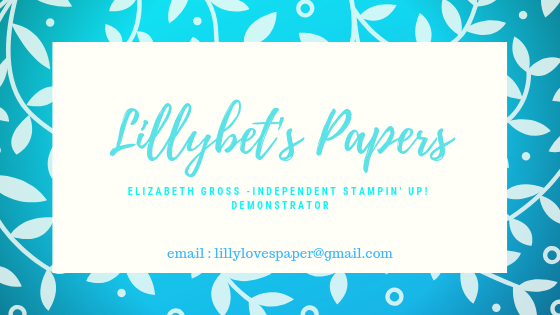 but they are so effective I thought I would do some for Christmas - and I had quite a few which sold at the Biloela Art and Craft Fair recently. Unfortunately I didn't get a photo of all of them before I went. They also look really effective hanging from a tree too. The Tiny Treat Boxes are such good value at $12.25 for 25. You need to make a little bridge from Kraft card - the same way as you would if you were making a card-in-a box - and then just embellish away. You can do almost anything as long as you make sure it will still fit in the envelope when folded flat. I write the numbers on the flaps for instructions on how to assemble. My Stall at the Fair with a few things hanging on the tree. CTC#55 Into the Woods with Rudolph. 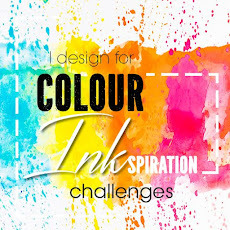 Welcome to my blogpage , you may have come from the amazing Alison's great blog, or you may be starting here, either way I hope you can continue around all the designers for some inspiration. The full list of participants is here if you get lost. 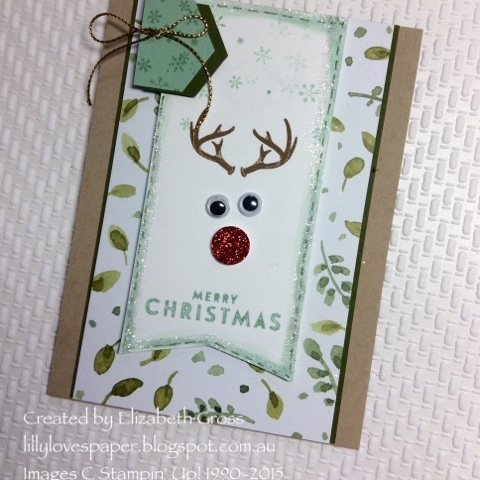 This week we are CASEing the Section of the Catalogue from pages 42-45 , but since it's Christmas rapidly approaching and I'm in Chrismas creating mode around here I've found Rudolph in the woods! Actually I have been pushed for time so was looking for something quick and easy to make. The cards on the bottom page 42 are both quick makes. 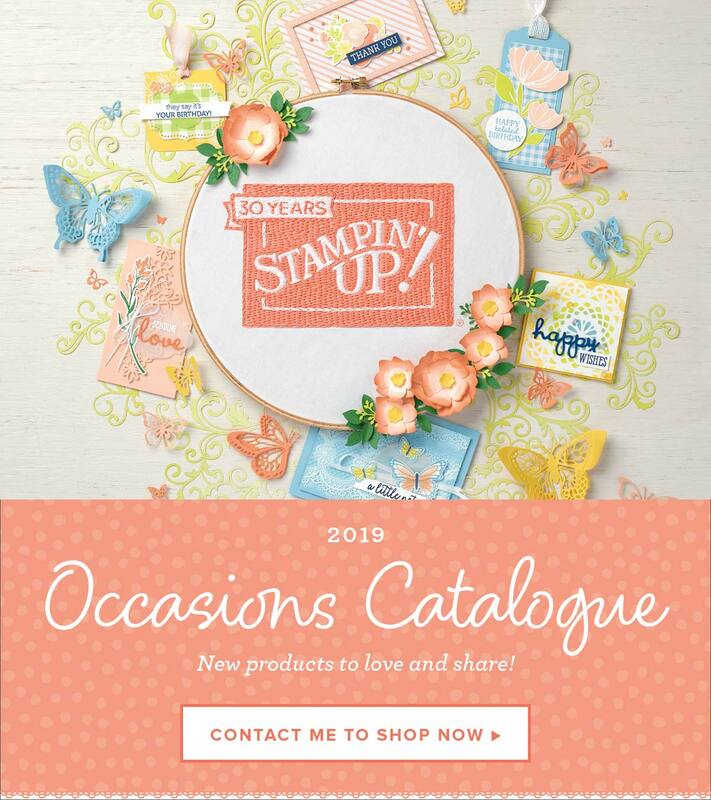 This is where the Catalogue is a great resource as you can flick through for some inspiration and you can be confident that the layout will work. There's nothing more disheartening than spending a long time creating something and then feeling that the balance is somehow a little off. Hence the CASEing the Catty philosophy. 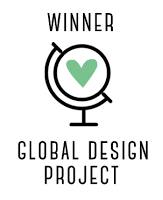 And it's always amazing to see what other designers see for inspiration from the same pages. We hope you are enjoying the Bloghop this week. These two lights use DSP as the background and a simple banner with some unfussy stamping as the centrepiece. 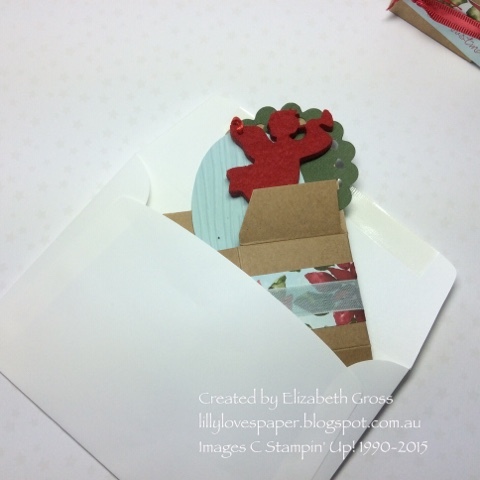 I have been playing with the gorgeous Wonderland set making designs for a Christmas Card Stamp-a-stack and a good friend set me an image of a Rudolph card using some antlers from the set. 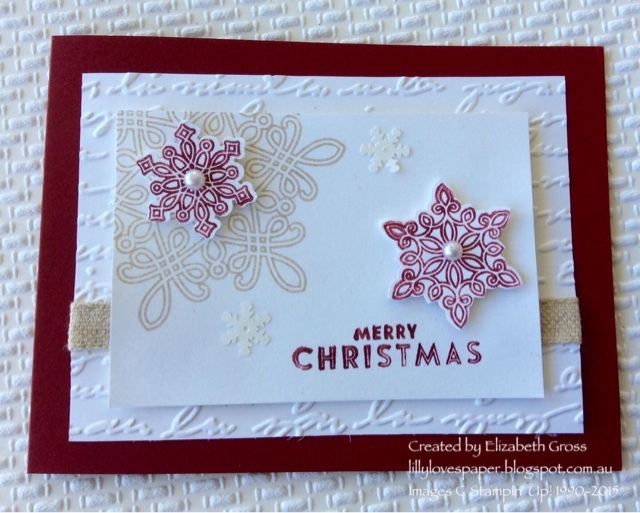 I don't know who created the original but I took inspiration from them and has lots of fun making tags, and little 3x3 notecards with the design, so Thankyou. I used the Antlers form Wonderland, some red glimmer paper and some Goggle eyes stuck on with Tombow- too easy! The larger card is done the same way with some BSP form Morning Meadow behind. I didn't have any timber elements, but the cardstock is punched with the hexagon punch and simply snipped off one edge to get the right shape. My original post finished here, but I had really hoped to make a card using Lighthearted Leaves as I think this is a truly beautiful set and it was one of my first purchases from the catalogue. 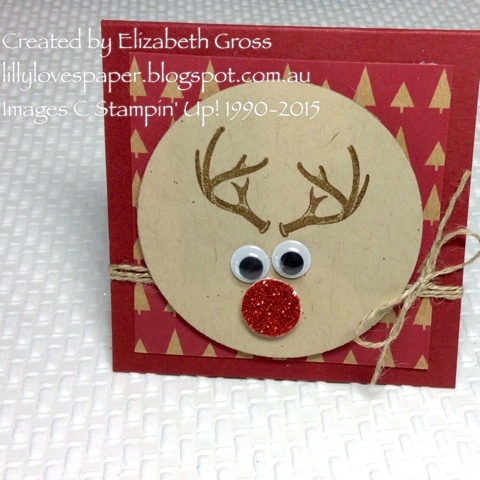 So using the same layout I have made this Christmas card, and I have to admit I'm quite pleased with this one. 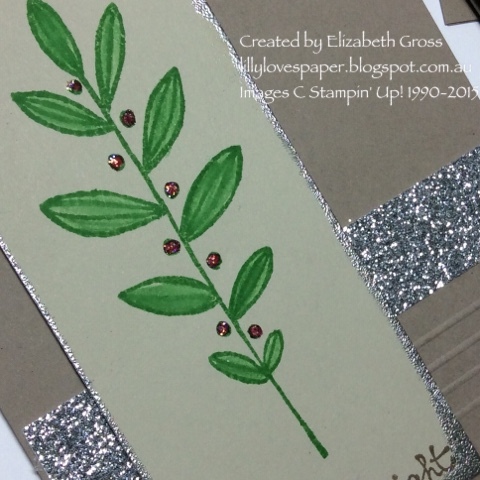 The leaf- or even it could be a tree- is heat embossed with silver powder and coloured with Cucumber crush using the marking pen and the blender Pen, some real red pen in the berries and silver foil and Cucumber card again cut with the hexagon punch. the sentiment is from Festive Flurry.There isn't any cucumber crush thread, so I coloured a few strands of the the White Jute ribbon with my marking pen - you may have read this tip on one of the earlier CTC blogs. 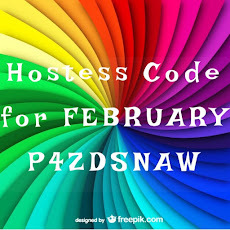 It's a really easy way to colour coordinate your embellishments. It is really hard to photograph silver but I hope you can get the idea. Thanks for joining us on the bloghop today, next up is Jackie, I wonder what she has created for us this week. Well I was too late - actually too busy - to get my post ready for last week but I had made the little boxes for the markets so thought I would add them in to the mix anyway post production... 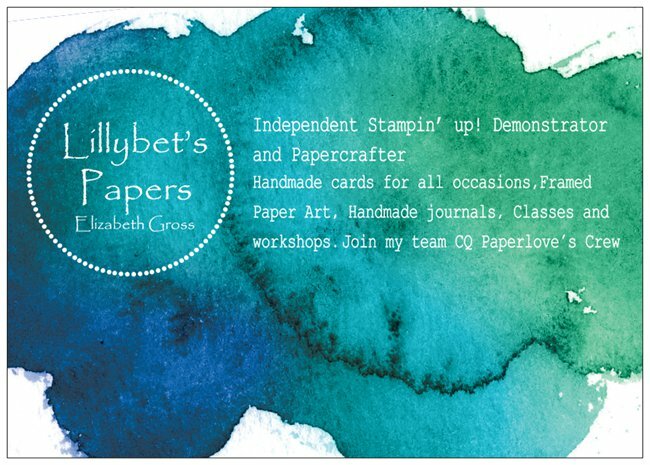 There are some gorgeous projects in the CTC blogshop this week and I hope you have been able to get some inspiration. 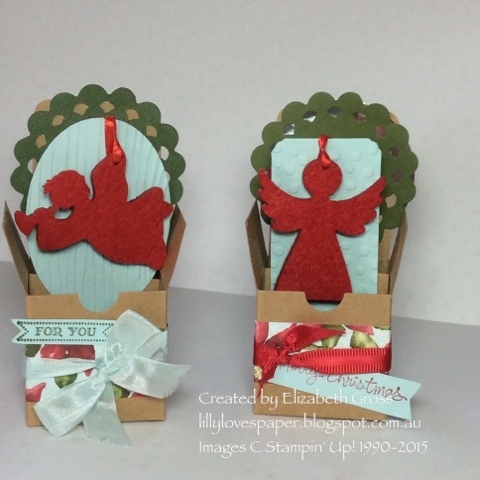 I have done these little boxes as cards in the past for Easter, ( You can see them here) but they are so effective I thought I would do some for Christmas - and I had quite a few which sold at the Biloela Art and Craft Fair recently. They also look really effective hanging from a tree too. 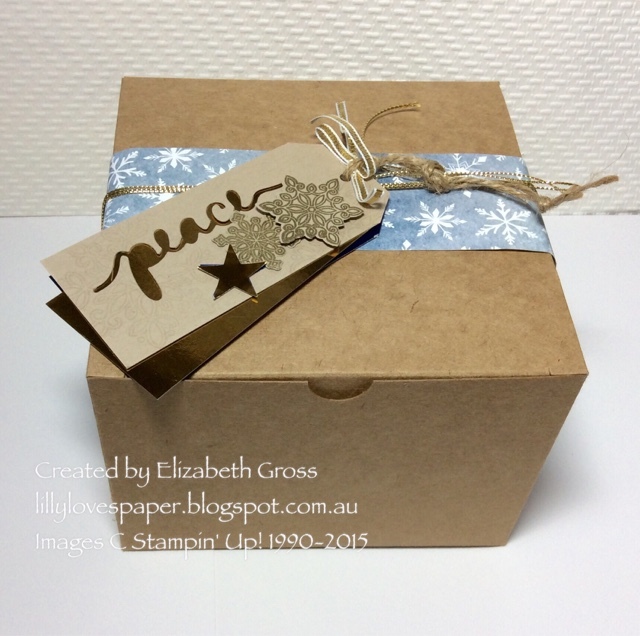 TheTiny Treat Boxes are such good value at $12.25 for 25. 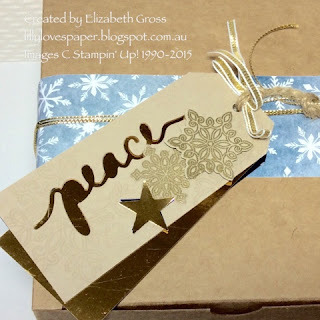 You need to make a little bridge from Kraft card - the same way as you would if you were making a card-in-a box - and then just embellish away. You can do almost anything as long as you make sure it will still fit in the envelope when folded flat.